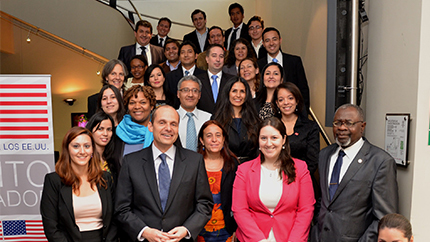 The U.S. Department of State hosted a Regional Alumni Seminar on Social Inclusion for Economic Development in Quito, Ecuador for 20 alumni of exchange programs from Colombia, Ecuador, Peru, Bolivia, Paraguay, and Uruguay. These emerging and successful entrepreneurs and NGO leaders are working to ensure greater economic inclusion for communities of indigenous and Afro-descendent populations, disadvantaged youth, persons with disabilities, the LGBT community, and women. Not only did alumni learn from each other, but they also learned about economic inclusion efforts in the region. Alejandra Castillo, the first woman of Hispanic descent to lead the Minority Business Development Agency, shared economic inclusion efforts for minority groups in the United States. Alumni also learned how grassroots groups and NGOs are providing job training to youth in Peru and Ecuador through support from the Inter-American Foundation (IAF).